Light Dependent Resistors are very useful especially in light/dark sensor circuits. The light detector itself is just 12mm in diameter with a lens and epoxy sealed metal package. Also used the male connectors for this cable! Only female grove cable was used! This water pump has more lift power than the RS-360, bigger outlets diameters, and the rubber retainers helps to secure the motor to some stationary object. Also i used Polyurethane(PU) based pipe for this pump with Outside Diameter : 8mm and Inside Diameter : 6mm. To control DC Water Pump and LED Grow Light. To switch MOSFET's ON and OFF. This is a 5V 4-Channel Relay interface module, for controlling various appliances, and other equipments with large current. It can be controlled directly by microcontroller (3.3V or 5V). To cut an acrylic base for the project! Mali (माली) is a Hindi word, commonly used for the person who makes and maintains garden. Have you tried kitchen gardening but given up after initial confusion and failures? Are you too busy to take care of your plants? Want to go on vacation but fear the worst for your indoor garden? Having green spaces in our homes the key to maintaining a happy and healthy lifestyle. Plants and flowers demand attention and delicate conditions to be healthy and look beautiful. Growing plants is a very pleasant experience. But our pace of life gives us little chance to keep the exact rhythm of watering the plants according to their needs. With how busy our lives are, it's sometimes easy to forget to pay a little attention to your thirsty indoor plants until it's too late and you are left with a crusty pile of yellow carcasses. The main reasons for dying plants are over- and under-watering, temperature and light issues. That’s probably happening because plants can’t talk and express directly what they need. They may need very careful and accurate watering. Some of them need more light and some need less. Air temperature and humidity are also highly important. SmartMali is a smart plant pot that has sensors to detect sunlight, soil moisture, air temperature and humidity. These are the most critical 'vitals' that indicate a plant's well being - does it have enough sunlight, water? They will send you these values on your mobile app and based on that you can take appropriate actions. Using this specialized sensors, it automatically waters and monitors your plants in real time. It is connected to the internet with SparkFun ESP8266 Thing Dev Board. You never have to worry about dead plants again. This automated smart pot will take care of watering your plants and provide artificial sunlight. The pot has a motor and a reservoir, which you can fill with water once in a while. App based control on watering. So when you press the 'water' button on your app, it sends the signal to the smart pot, which actuates a motor in it. 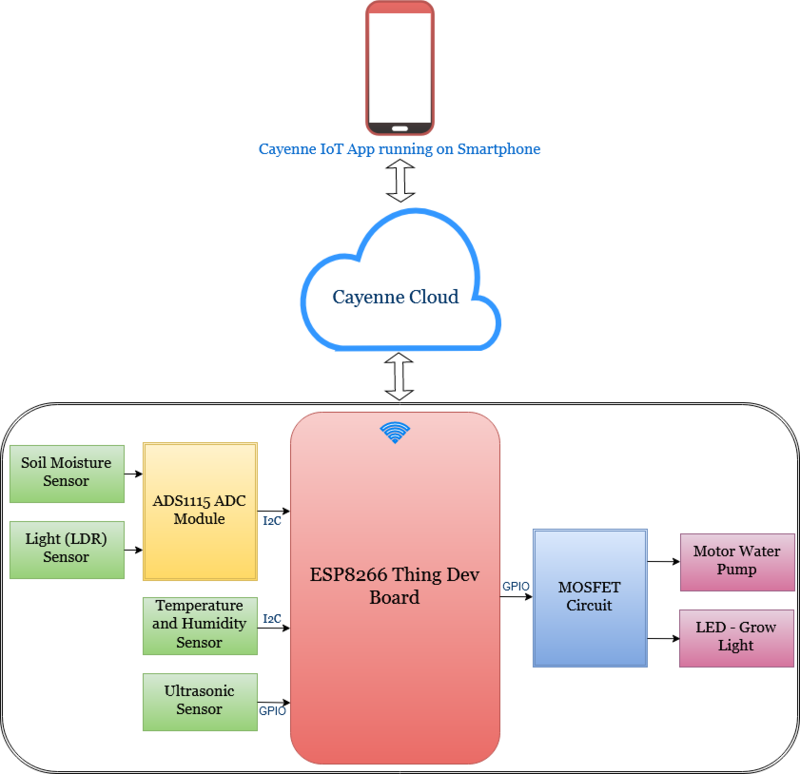 In this project we have two analog sensors (Light Dependent Resistor and Soil Moisture) to be interfaced with the ESP8266. But ESP8266 has only one 10-bit ADC which can read maximum voltage of 1V. So we are going to use an external ADC like ADS1115 for reading those sensors. The ADS1115 is a 16 bit Analog Digital Converter that can greatly improve your micro-controller resolution and measurement accuracy. It has four input channels that can be configured for Single Ended, Differential or Comparator Measurements. For our project we have to just read the analog sensors so we are going to use two channels for single ended 16 bit measurement with the ADS1115. ADS1115 Chip has a base of 7-Bit i2C Address of 0x48 (1001000) and i2c addressing that allow four different addresses using one address (ADR). Though you see i told you ADS1115 is a 16-bit ADC but the output of the ADS1115 is a signed integer. That means one of the bits in the 16 bit words is going to be used to tell us if it’s a positive or negative value being reported. What this means is that there are 32,768 possible output values, where zero is the first and 32,767 is the last. 2^16 = 65,536. i.e. if the ADC used unsigned integer it would have been able to have 65,536 possible output values, where zero is the first and 65,535 is the last. The value of a bit is determined by the Programmable Gain Amplifier (PGA) setting as is this setting establishes full scale. In the default mode, the setting is +/-6.144 volts. Thus the value of 32767 would represent a value of 6.144 volts. Dividing 6.144 volts by 32767 yields a scale factor of 0.1875 mV per bit. The PGA setting of +/- 6.144 range can be a little misleading as it seems to infer that you can measure voltages that high. You can’t. Instead, the maximum measurable voltage is established by the supply voltage to the chip. Specifically, the maximum measurable voltage is 0.3 volts more than the supply voltage. In fact, exceeding this voltage at your analog input may damage your chip. So that means if you provided VCC of 5V to ADS1115 and have set PGA setting of +/- 6.144 range still the maximum voltage you can apply at the analog input must not be greater than 5.3V (5 + 0.3) . In our case though we are setting the PGA to +/- 4.096V as our sensors can maximum output 3.3V and not more than that. So that means we will get a scale factor of (4.096/32767) 0.125mV. i.e. 1 bit = 0.125mV. LDR is connected to via voltage divider with A0 of ADS1115 ADC module. While Soil Moisture sensor is connected to A3 of ADS1115 ADC module. A photoresistor or LDR is a component that is sensitive to light. When light falls upon it then the resistance changes. Values of the resistance of the LDR may change over many orders of magnitude the value of the resistance falling as the level of light increases.It is not uncommon for the values of resistance of an LDR or photoresistor to be several Megaohms in darkness and then to fall to a few hundred ohms in bright light. The soil moisture sensor is a simple breakout for measuring the moisture in soil and similar materials. The soil moisture sensor is pretty straight forward to use. The two large exposed pads function as probes for the sensor, together acting as a variable resistor. The more water that is in the soil means the better the conductivity between the pads will be and will result in a lower resistance, and a higher SIG out. To get the Soil Moisture Sensor functioning all you will need is to connect the VCC and GND pins to ESP8266 Thing Dev board, you will receive a SIG out which will depend on the amount of water in the soil. One commonly known issue with soil moisture senors is their short lifespan when exposed to a moist environment. * In ESP8266 EEPROM library uses one sector of flash located just after the SPIFFS. * whenever you wish to save changes to flash. * size being the number of bytes you want to use. * Size can be anywhere between 4 and 4096 bytes. * write the value to the appropriate byte of the EEPROM. * these values will remain there even when the board is turned off. This economical sensor provides 2cm to 400cm of non-contact measurement functionality with a ranging accuracy that can reach up to 3mm. Each HC-SR04 module includes an ultrasonic transmitter, a receiver and a control circuit. There are only four pins that you need to worry about on the HC-SR04: VCC (Power - 5V), Trig (Trigger), Echo (Receive), and GND (Ground). 1) I need to know how much amount of water my plant consumes and also how much amount of water is remaining before the water reservoir needs to be refilled. 2) Also because i can't just dry run my R385 High Lift Water Pump, the pump will get damaged. So what i will do if the water level is below the threshold the pump will not start. In my case i have set the threshold as 10mm since the water pipe i have used for the pump is of 6mm. Note:- I know this HC SR-04 is not water proof but since it was lying around i used it. But let me know which sensor would be better to use in this scenario. The sensors needs to be cheap and accurate atleast in mm range. Also the reservoir i have used in this project is almost cylindrical and of height 9cm and radius 8.5cm. So the sensor also needs to be small and it should have a atleast measurement range of 0 to 20cm. * The sensor is triggered by a HIGH pulse of 10 or more microseconds. * of the ping to the reception of its echo off of an object. This sensor was added to let us know whether e area where the plant has been placed is decent enough for the plant to survive. Also, in future i will use some mist nozzles and a fan to control the temperature and humidity around the plant. This is a N-channel 60 V, 0.015 Ω, 50 A Power MOSFET. It is suitable for use as primary switch in advanced high-efficiency isolated DC-DC converters for telecom and computer applications, and applications with low gate charge driving requirements. Or you can also use 5V Relay Module with Optocoupler Isolation. Relays are not a great solution for controlling a DC Motor and a DC LED Grow Light. It would be better to use a MOSFET for this job. STP55NF06 MOSFET i used (was lying around in my components box) was not triggering directly by the GPIO's 3.3V but were working fine with gate voltage more than 4V. So i used 2N2222 transistors as a switch to trigger the MOSFET's. The NDP6020P is a very common MOSFET with very low on-resistance and a control voltage (aka gate voltage) that is compatible with most 5V and 3.3v micro-controller. This allows you to control high-power devices with very low-power control mechanisms. 7805 IC provides fixed +5 volts regulated power supply with provisions to add heat sink as well. 7805 is not very efficient and has drop out voltage problems. The difference between the input and output voltage appears as heat. A lot of energy is wasted in the form of heat. If you are going to use 7805 then you need to be using a heat sink too. (5 x 0.5Amp) = 2.5W. 2W energy will be wasted as heat. So Higher the input voltage, less efficient your 7805 will be. An estimated efficient input voltage would be over 7.5V. Now in our case since we need 12 volt to drive water pump motor as well as LED grow light we will be using the same to power our ESP8266 Thing Dev Board by step down the 12 volt to 5 volt using 7805. Also, it's cheap and was lying around in my electronic components kit. Before programming the ESP8266 Thing Dev Board by Sparkfun you will need to install ESP8266 addon for the Arduino IDE. Some Example Sketches for getting started! In this project i am not using an event currently. I was going to use it to schedule the LED Grow Light time period i.e i want the LED grow light to b switched ON between a specific period which is between 6am to 8pm. So the plant can get a proper sleep between 8pm to 6am. And as we have added a LDR the LED grow light will be switched ON between 6am to 8pm only when the light level is detected low. The below will help you to control the relays via the Cayenne platform or Cayenne Mobile App. * and select the correct ESP8266 board before compiling. * Publish data every 30 seconds (30000 milliseconds). * Change this value to publish at a different interval. * The speed of sound is 340 m/s or 29 microseconds per centimeter. * object we take half of the distance travelled. * The ultrasonic sensor is triggered by a HIGH pulse of 10 or more microseconds. * which if Light level falls we will swiitch ON the LED grow light. * This value will remain there even when the board is turned off. * which if soil moisture level falls we will swiitch ON the Motor (water pump). Thank you for reading and comment below if you have any suggestions or doubt! Motor (Water pump), Solid state relay and PCB is attached to this acrylic sheet which has been cut using Laser Cutting Machine. It's an high level overview which will help you understand how the setup works on a higher level. You need to install ESP8266 Add-on in your arduino ide. Also you will need to install below arduino libraries required for successfully compiling the below code. * Write data to Cayenne here. * This code sends the current sensor readings to Cayenne.